You are at:Home»Featured Articles»Wetland Ecology»Urban wetlands: Hype about attraction, less action for protection! Wetlands are a special gift of nature which adds beauty to urban landscape. They are one of the most diverse and productive ecosystems not only in any part of the country but also in cities, where the existence of natural landscapes is rather uncommon. Wetlands are home to a variety of plants and animals making them ?wild areas?. Cities are the driving force for social and economic development and thus threaten the urban landscapes specially deteriorating in quantity and quality. Most of urban wetlands in Sri Lanka have now disappeared, and many of the remaining areas are in danger largely due to human disturbances. Wetlands face many threats. Pollution due to point and non?point sources of sewage and effluent entry and solid waste dumping have become a major issue. This situation has caused problems to the aquatic environment and its inhabitants including people. In the most populated Western Province, 20% of the landscape is comprised of wetlands and almost all receive unbearable loads of pollutants. 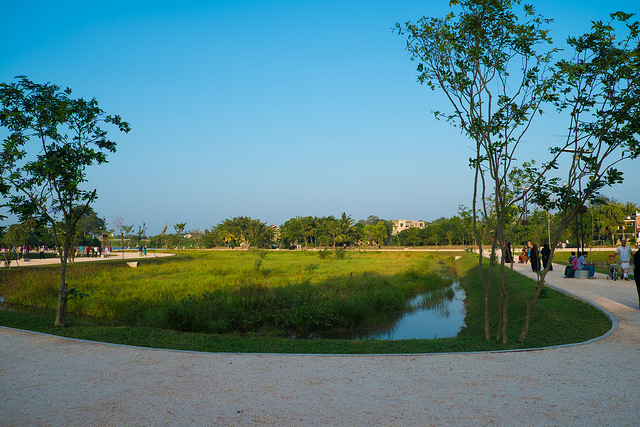 Beira Lake, in the heart of Colombo, receives a wide array of contaminants ranging from municipal sewage and industrial effluents which are dumped in wetlands since the city has evolved with inadequate waste disposal facilities. One good example is the construction of toilets. The majority of these semi?permanent dwelling units do not possess healthy toilets with safe disposal of excreta. Eutrophication, caused by excessive concentrations of nutrients, is often reported and has caused thick algal growth making the lake green in color. Encased production of noxious gases and foul smell due to anaerobic microbes and decreased oxygen levels, leading to fish kills, are evident, especially in the dry seasons. Pollution from heavy metals including Chromium, Cadmium, Zinc and Lead is increasingly reported from urban waters. In Bellanwila Attidiya Sanctuary, which is composed of flowing as well as stagnated waters, heavy metals have been found in the sediments, water and planktons as well as in fish and amphibians. Due to their high sensitivity to waterborne chemicals, amphibians in this habitats have been found to exhibit suppressed immunity and interior tissue damages which ultimately harm their health. Both in this Bellanwila Attidiya sanctuary and Lunawa lagoon in Panadura, high amounts of heavy metals have been found in fish. This situation poses severe threats not only to aquatic carnivores but also to humans since some fish like Tilapia are captured for consumption. Microbial contamination of wetlands which are interconnected to the subsurface aquifers has caused pollution in the adjacent dug wells. One good example is Kotte Kolonnawa Wetland Complex, where at least 50% of the wells situated in the periphery of the wetland have been contaminated. Encroachment and illegal filling have caused wetlands to shrink in size in all urban wetlands. These activities cause alternations in hydrological regimes, sedimentation and habitat fragmentation. One major issue is the demand for land is ever increasing in cities and one possibility is to fill up a natural habitat. Thus, these habitats have lost a portion of its original extent in a varying degree of urbanization. Most of the encroachers being illegal, their activities too are not regulated properly. It is a common practice to dump the waste directly to wetlands. 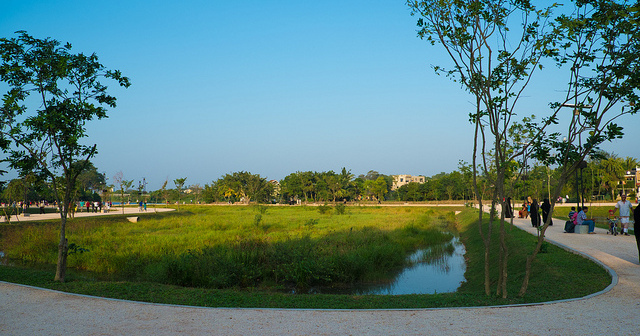 Parts of Lunawa lagoon, Negombo Lagoon and Bolgoda lake have been developed into places of tourist attraction with the construction of hotels and lodges. Specially, Negombo lagoon has reduced its size dramatically in the last few decades due to the development of the fishery harbor. Filling for the expansion of infrastructure that includes roads and bridges have also put these sensitive habitats in peril. Wetlands have been converted to agricultural lands since the availability of water is an attractive factor. For instance, the land area of the Bellanwila Attidiya has been reduced by 25% in the last few decades and some lands have been utilized for cultivation of paddy and other commercial crops. Not only chemically and physically, wetlands have been affected by biological factors too. All urban wetlands have been reported to be affected by invasive plants and animals. For instance, high proliferation of invasive Anona glabra shrub have reduced the extent of wetlands. This situation is very common in Kotte Kolonnawa Wetland Complex. Surfaces of most wetlands have been infected with stubborn aquatic weeds such as water hyacinth and salvenia, which, unless removed on time, could impair the natural functions of waterways. Invasive fish such as tank cleaners, kissing gurami and knife fish have been reported in many wetlands. These exotic fish that could have been introduced deliberately or unintentionally, compete strongly with native fish for survival. Invasive fish are found to compete for food and refuge as well as they can eliminate the locals by consuming the eggs and adults. The threats have induced changes that have eroded the ecological and socio?economic values and services derived from wetlands. This situation warrants quick attention of the stakeholders ? scientists, policy makers, environmentalists and the community ? to work together for their healthy survival. * Dr. Wickramasinghe is a senior lecturer in Zoology at the University of Colombo, Sri Lanka.